As you know if you follow my blog, Deek and I are always up for a grand adventure (and for money saving techniques--Dave Ramsey style). You may also know, from our trip back East last November, that I'm terrified of flying. I mean, I all kindsa hate it. So, Deek and I decided to combine adventure, money saving, and no flying into a cross-country train trip! LOL! When I tried to look into how to travel across the country by train, I didn't find a lot of great information, so I'll try to be as informative as possible to help those considering this same venture. First of all, we decided to ride in coach instead of doing a sleeper car. The sleeper car was a ton more expensive compared to coach. On the train, coach seats are SO much bigger than on an airplane. There is a lot of space within in the seat and a good deal of leg room. Deek is 6 ft tall, and he didn't feel cramped. Each seat has a pull-down tray. They also recline back with a footrest that also extends out. In front of the footrest is a bar where you can prop your feet too. Coach has no showers, so be prepared to be a little ripe by the end of a long journey. I recommend packing wet wipes, dry shampoo, hats, and/or bandannas. 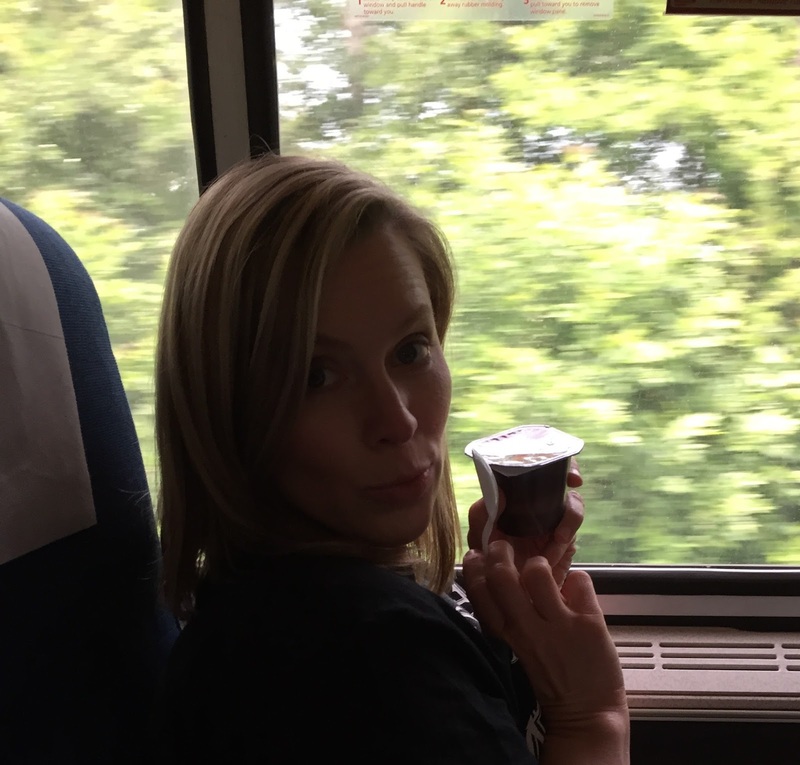 For food and drink, we brought our own rather than pay the crazy prices in the cafe and dining cars. Managing your own food can be tricky in terms of the baggage weight limits. Each person is allowed two carry-on bags and two checked bags. All bags must weigh no more than 50 pounds. Secret tip: No one ever weighed our carry-on backs, but our checked bags always got weighed. If you can lift your carry-on bag on and off the train (and into the rack above your head), no one should bother you about the weight. Also, you will have access to boiling water and ice if you want to pack your own Via coffee, tea bags, or soda. Regarding electronics, you will have two outlets per set of two seats. But on most trains, there is NO WiFi! You need to be prepared to create a hotspot from your phone if you need to use the internet. Because Deek teleworked a lot on the train, we had to do that. If you take trains from one part of the East Coast to the other, or even from Portland to Seattle, you will have WiFi (but it's not super great). And bring your headphones. If your electronic device makes noise, you MUST wear headphones. We started out in Union Station in Portland, Oregon. The first leg of the trip goes from Portland to Chicago. This train is called the Empire Builder. The Empire Builder is a double-decker train. There is super small section of seats on the lower level (usually for the elderly or handicapped), and a lot of seats on the upper level. The staircase for the upper level is very narrow, so keep that in mind when packing your bags. The bathrooms are on the lower level. There are about 4 closet-sized bathrooms (maybe slightly bigger than an airplane), one larger handicapped bathroom, and one women's lounge. The women's lounge has a stool for putting on makeup, seats, and double sinks. Sometimes men don't read the door and realize it's women only, and there is no lock on that door. We are in our seats, ready for this adventure! Here we are in the observation car! This car has windows from top to bottom as well as couches, booths, and twirly chairs. Usually the cafe car is underneath the observation car. So many beautiful sights to see! The Portland section of the Empire Builder heads directly from Portland to Spokane. In Spokane, it waits at the depot to hook up to a train coming from Seattle. The two trains form one long train for the cross-country trip. Well...the Seattle train ended up being 5 hours late (yes, FIVE). I've never been to Spokane, and I'm sure it's a nice place. But after seeing it for 5 hours, I began to loathe it. Apparently, there is a tunnel coming from Seattle, and a freight train got stuck in said tunnel. The Amtrak train had to wait for a little towing train to come, hook up to the freighter, and pull it back to the next switch--which was 100 miles away. At this point, I began to worry. Our layover in Chicago was only 3 hours, and we were already 5 hours behind schedule. The conductor assured us they could make up time, so there was a good chance we'd make our connecting train. Me on the first night--stuck in Spokane. I'm sleepy and unamused. Sleeping in coach: I personally had trouble sleeping in the coach seats because of my height (5'2"). I was too short to benefit from the reclining leg rest since my feet hung just off the end of it without actually touching the other foot bar nearby. But I was too long to pull my legs up into the seat comfortably. Plus, the recliner created a big gap between the seat and the foot part. If I curled up my legs on that, the part of my leg in the gap would fall asleep. I even stuffed my jacket into the gap to try and help my legs, but it didn't really work. Deek slept much better as he was long enough to take advantage of the foot recliner and foot bar. Montana. On the Empire Builder, you get to go through Glacier National Park and other breathtaking locations along the way. The sunsets just blew me away. Yep, that's snow...in May...in North Dakota. The Empire Builder travels into North Dakota, right along the Canadian border. So--surprise!--it snowed. Where I'm from in the South, we'd call this a dusting. BUT apparently this dusting foiled the engineers because we were stuck in ND for 4 hours. They said the switch froze, and they couldn't get us on the right track until they defrosted it. However, this excuse perplexes me. The Empire Builder travels this same route all year long. In the winter, the snow in North Dakota must touch the tops of the train windows. Why were they not prepared for snow and frozen weather? At this point, I knew we were going to miss our connecting train in Chicago. So, the question then become...what was Amtrak going to do about it? Deek and I had a budget for this trip, and it did NOT include a hotel room in Chicago. Last day on this leg of the trip. We know we're running about 9 hours behind, and we aren't sure what to expect in Chicago. Since Amtrak had royally messed up this trip, they fed us lunch that day in the dining car for free. The beef stew was yummy, and the views were amazing. That night for dinner, Amtrak catered Subway for the whole train. I appreciated the free meals and the service we received from our conductors on the train, but I still worried about our arrival in Chicago (Deek is super zen, so he was like, "It'll be fine, baby."). We *should* have arrived at 3:45 P.M. that day and caught the next train out at 6:45 P.M..
Whatcha gonna do about our 9 hour delay, Amtrak? Chicago: We arrived in Chicago at 12:30 A.M. Union Station in Chicago technically closes at midnight, so thankfully we didn't have to deal with the normal hustle and bustle of the station. We did, however, have to go talk to passenger services about a hotel. After an hour of haggling, they agreed to put us up in a hotel for the night. They chartered a bus to take all the passengers who'd missed connections to this hotel. We sat on that bus waiting for everyone else to haggle with Amtrak until 2:00 A.M. Then, the bus driver told us there were no places to stay in downtown Chicago because of a food convention, so we must travel 45 minutes outside of town to reach our hotel. We arrived at the hotel at 3:00 A.M. We assumed the hotel would just hand us a key when we walked in, and we could finally go to bed. No such luck. We had to form a line and check in like normal (the only difference: they took our Amtrak vouchers as payment instead of regular forms of payment). Deek and I FINALLY got into the hotel room at 4:00 A.M. We were told by the bus driver that we had to be back outside and on the bus the next morning at 11:30 if we wanted a free ride back to the train station. The next morning, we hauled ourselves out to the bus, along with the other bedraggled passengers who'd been on this journey with us. Some people missed the bus, bless their hearts. And off we went to spend 5 hours sitting in the Chicago train station. Amtrak did give us food vouchers so we could eat lunch and dinner at the station while awaiting our train. Here are some things to note about Union Station in Chicago: They have terrible WiFi and very little available seating. Several of the electrical outlets don't work. There are only two women's bathrooms, and they are both swamped at all times. You will only find out your track assignment (where you are supposed to go to get on your train) about 30 minutes before it's time to board. Yipes! 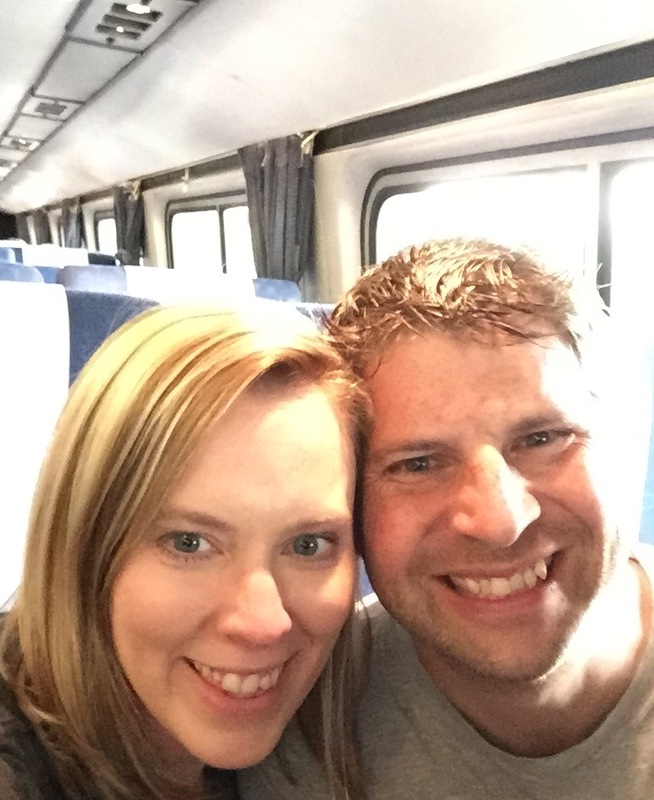 We finally boarded our next train, a day late, to head from Chicago to Washington, DC. We made it on the train! Another night on the train. More of our beautiful country. One cool thing about traveling by train is you get some longer layovers in some cool places. When we traveled by plane, we had a layover in JFK, but we didn't get to see a speck of New York because we just ended up running from terminal to terminal. With the train, you have the opportunity to leave the station and explore a bit before jumping back on for your next ride. So, we were stoked about having a longer layover in Washington, DC. I've been a few times, but Deek has never been. We FINALLY made it to DC! Things to know about Union Station in DC: This train station was our favorite by far. It was easy to navigate, had lots of shops and eating place, and served both Amtrak AND the DC Metro. Union Station in DC is gorgeous. 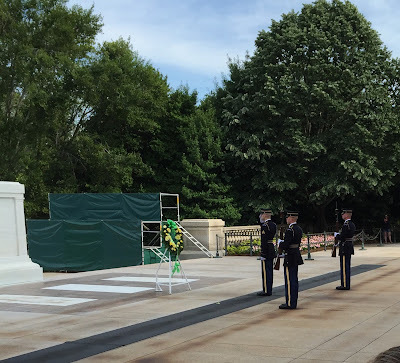 Since Deek has a long line of military folks in his family, he really wanted to see Arlington. He even wrote a blog, The Price of Freedom, about the experience. Before heading there, we stopped in at Bojangles downstairs at the station for some chow and sweet tea for Deek. All my family and friends in the South keep telling him he MUST try Bojangle's sweet tea, and he FINALLY got the opportunity. Ironically, he tried it in DC instead of in the South. LOL! After that, we hopped on the Metro from Union Station and got off at the Arlington stop. The DC Metro is super easy to navigate. We got to see the changing of the guard at the Tomb of the Unknown Soldier. After our layover, we got our luggage and boarded the train again, this time for a stop in my hometown! This short train ride had WiFi and bigger bathrooms than the cross-country train. WUT? The train goes right by the Washington Monument! Yay! A short train ride! We made it!! We are packed into my parents' car, ready to visit family and friends! We were so excited to see family and friends, have our second wedding, and have our honeymoon! BIG thank you to everyone who gave us a place to stay! You rock, and we SO adored spending time with you!! ((BIG HUGS)) We are blessed beyond measure to have such amazing people in our lives! We love you! After a lovely visit, we boarded the train again. This time, we had a long layover at Penn Station in New York City! Back on the train. Yummy cold food. Hello, you beautiful Big Apple you! Things to know about Penn Station: It's about the same size as Union Station in Chicago, but it's laid out in a big circle. It also houses the Long Island Expressway and the New Jersey Transit AND it's underneath Madison Square Garden, so it's busy inside and outside. Amtrak does offer a nice, big lounge in the center of the station. You must present your Amtrak ticket to gain entrance, so there aren't as many people inside the lounge. Biggest note: You only have 10 minutes from the time your track is called to get there and board. The NYC train leaves on time whether you're on it or not. We'd recommend scoping out all the entrances to the Amtrak tracks so you can bolt when your track is called. Deek and I discussed it beforehand and knew we wanted to see the 9/11 Memorial and FAO Schwarz (since it's closing its doors on July 15) in NYC. Here's a good tip to remember: The 9/11 Museum gives away FREE tickets on Tuesdays beginning at 4:00 P.M. Since we just happened to be there on a Tuesday, we got in line and got free tickets. I don't have the words to describe how the 9/11 Memorial, the museum, and the Freedom Tower made me feel. Deek looking out over the waterfront near the Freedom Tower. You can see the Statue of Liberty in the background. Some of the yachts docked there had helicopters on the back of them. What the what? Next, we headed to the Upper West Side to see Central Park and FAO Schwarz. We wanted a chance to dance on the Big Piano before the doors of FAO closed for good. Deek, a former musician, enjoyed visiting Strawberry Fields--a John Lennon memorial--in Central Park. We opted for a horse-drawn carriage ride from Central Park over to 6th Avenue. I've ALWAYS wanted to do a carriage ride. We snuggled, and snuck in several kisses, as we rode along people-watching and enjoying the beautiful day together. The Big Piano! We made it! Annnndd, we're back on the train. Penn Station to Union Station in Chicago. Small layover in Chicago. Then Union Station Chicago to Union Station Portland. I really enjoyed being able to see so much of our beautiful country!! YES!! We made it to Portland, only 1 hour behind schedule! Deek and I have now traveled across the country by every available means--car, plane, and train. After much thought and discussion, we'd say our favorite way to do the cross-country adventure is by car. BUT we think everyone should try the train at least once. And we totally recommend the train for shorter distances like DC to the South (you avoid all that DC traffic) or Portland to Seattle. Hope you found this post both informative and fun! Feel free to share any train adventures you've experienced or ask any questions you may have!